Jurassic Coast and Cornish tin mines - Visits some incredible chevron folds at Milook Haven. Ocean Crust and Mountains of Mantles - visits the largest mega sheath fold in the world and sites with folded sediments in the Hawasina nappe of the Semail Ophiolite. The Birth of Geology - visits Knockan Crag where the first world's first identified thrust fault, 'The Moine Thrust' was identified. Castles and Dragons:- Visits Bwa Maen a Variscan Fold in the Fforest Fawr Geopark. 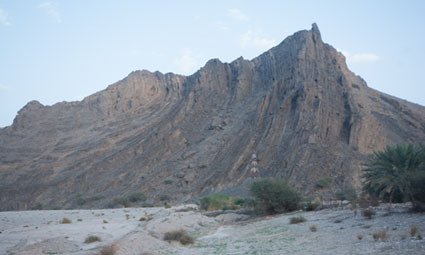 The world's largest mega sheath fold, visited on our Oman trip.